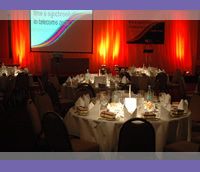 Avren Events: Avren Events run high-level conferences in the telecommunication sector. Over the last six years we have managed the technical elements of most of their conference worldwide. This includes set stage and technical design, managing the tender process for contractors, and on site management. Carnival 365: This joint festival run by Charlton Athletic FC and Greenwich Council is attended by around 5,000 people. 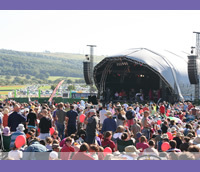 As site manager I had responsibility for the design and delivery of the entire site including two stages, various marquees, toilets, fencing, power, fire provision, stewarding, and waste clearance. 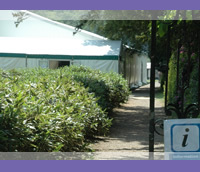 Ashburnham Christian Trust: Over a number of years I took on responsibility for providing site management for the summer events at Ashburnham Place, including designing the site and managing provision of all infrastructure & technical elements. Clients included Ichthus, NFI and Salt & Light. Greenbelt Festival: As one of three production managers between 2007 & 2009, I was responsible for delivering the site for E&MS, the main contractor. Located at Cheltenham racecourse, it is a largely greenfield site, and with just 3 weeks we prepared it for 20,000 campers & festival goers. Love Oxford: Subcontracting to Pure Solutions, I was responsible for oversight and delivery of this outdoor event held in the centre of Oxford by local churches, and attended about 5,000 people. Whatever the size or type of event MG Event and Sound can put into place the things needed to make it a great success. We are always happy to take time to talk through your needs to ensure we can work out the most appropriate way to help you have a great event. Full Management Service: For many people a ‘walk in’ service can be attractive. We can take on all aspects of managing your event so that you can concentrate on the content of it rather than practicalities. The extent of this depends on your requirements. 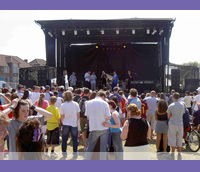 Production Management: Particularly on large or outdoor events, a significant amount of infrastructure can be required. We can source suitable suppliers and provide on site management and supervision of contractors, ensuring that a high standard of provision is reached and it all runs smoothly. Technical Support: We have a significant amount of sound, video & lighting hardware available in house. This enables us to resource most events internally which both ensures the standard of service, and that you get a cost effective solution. 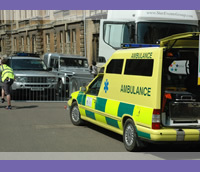 Risk Assessment and Event Health and Safety: This is a central aspect of event management. We can help you ensure that your event is safe for the public and staff alike and meets H&S requirements made by licensing authorities.